Keycard for the Kripalu Center for Yoga and Health in Stockbridge, MA. 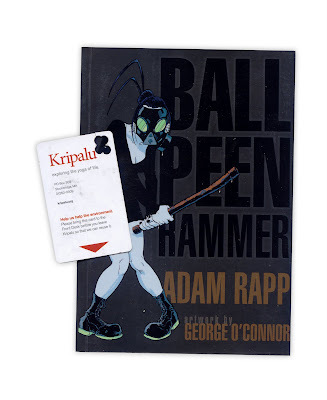 Found in "Ball Peen Hammer" by Adam Rapp, artwork by George O'Connor. Published by First Second, 2009. What a wonderful idea for a blog. I felt like I was taking a glimps into years past. I loved it and I look books. What a great job you have. My perfect job would be to work in a bookstore and to write books. I'll definately check back. If you'd like a few chuckles in the morning....take a peek at my blog. I just started it this month and would love your feedback. I didn't even realize that this book isn't even out yet, I must have picked up someone's ARC or something. Readers - pick up a copy when it comes out, it was a great read.